Bonaparte’s rear guard managed to hold off the aggressive pursuit of the Duke of Wellington at the Sanok River in a hotly contested battle. 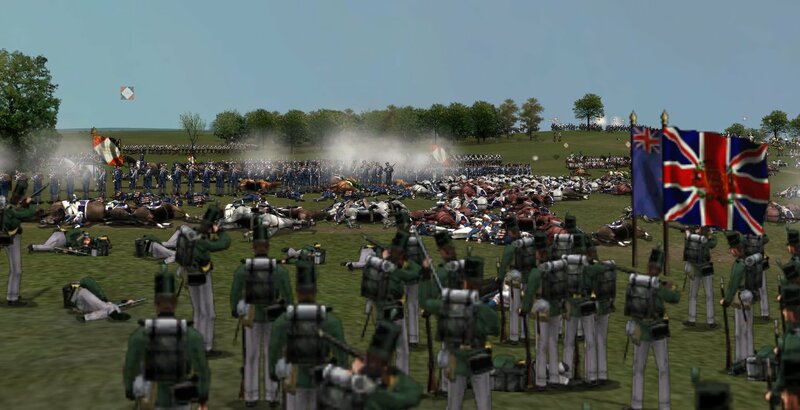 The fight was marked by desperate cavalry charges and counter-charges, infantry formations changing quickly in and out of square, and savage close combat. In the end, the French high-ground advantage and interior lines were major factors in the Emperor’s success. Overall, 12,441 men came to battle for the Anglo-Allies while 10,946 wore the French blue. Wellington’s force suffered 5,062 casualties and the French 3,951. Follow the link below for a PDF detailed summary of the battle results and player order of battle. Mitra - what do you use to record? Fraps? Or another utility? How do you get it to make a single 2 hour video, as mine makes 15 min sections at lo res and 3 min sections at hi res. Do you splice them together? If so with what program? Do you have a paid YouTube account? They won't host videos over 15 mins unless you pay so I presume you do? Mr. Digby wrote: Mitra - what do you use to record? Fraps? Or another utility? I use Bandicam, which registers the videos already compressed, of course the payment version. On you tube you can activate the option for have more than 15 minutes videos, you should have the option in the uploading page: https://www.youtube.com/my_videos_upload. Thanks. I've installed a bought a license for Bandicam. It seems so much better than Fraps. Mr. Digby wrote: Thanks. I've installed a bought a license for Bandicam. It seems so much better than Fraps. 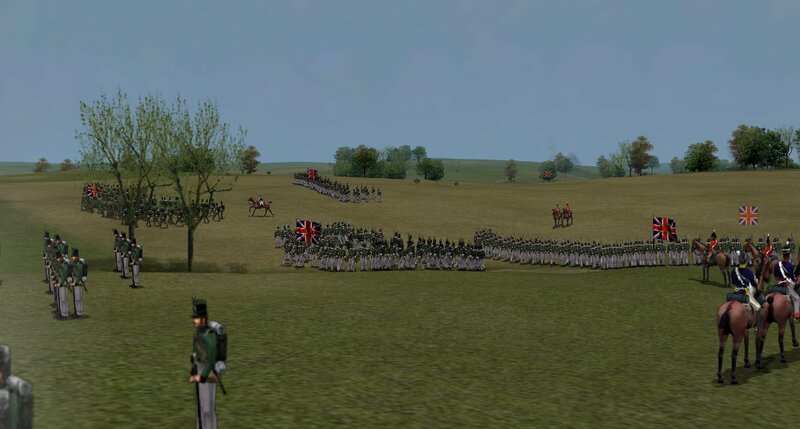 Picton's Division sets off on it's long flanking march, via Berlin, or so it seemed at the time! Two battalions of King's German Legion light infantry are deployed as a skirmish screen to cover the column. We finally come around behind the French right but a Caribineer brigade deploys to slow our advance to a crawl. We push forwards eventually and the KGL light troops skirmish forwards aggressively. Armed with Baker rifles they did a good deal of damage to the French line but their hovering cavalry support obliged us to form squares quite often and in that formation our losses slowly mounted. The splendid British hussars. Sat on their hill. Looking splendid. And very clean. And rested. Uncle John ably commanded the second brigade of Picton's Division - the Brunswick Avante Garde, Leib Garde and 3 Light Battalions. Here they are advancing smartly in lines but having to halt now and again to make hasty squares as the French cavalry seemed to be everywhere, especially on our left where we had no friendly cavalry support. Towards the end of the fight with masses of dead horsemen in heaps between the infantry lines. We fought hard and well and held the objective for about 30 minutes but the rest of our army (the right wing) collapsed trying to attack the enemy held hill (seen in the right background) and so our holding of the objective was for naught as we had to retire whence we had come or else face the whole of the French force once our right wing had crumbled. It was one of those very tough see-saw battles where you know you're winning and will eventually prevail, only to find out that across the other side of the battlefield everything is caving in in disaster and they just haven't told you! I know aysymetrical armies can create great games but having 9 elite French cav sqns in 2 brigades vs 6 good British ones in one was a factor that gave the French a fairly easy victory here. 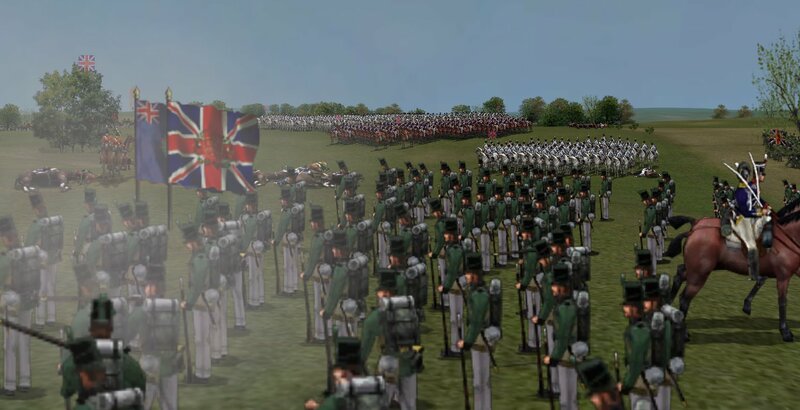 People are getting so good at using cavalry and infantry commanders cannot possibly hope to get all their troops in square when they need to (espcially when 2 infantry players leave the game) that cavalry is really coming to dominate our games. I still think its too powerful. I wasn't very happy that Mitra held his carabineers behind his infantry lines and simply threw them through the ranks whenever they were needed. I think that practice should be reviewed as the French infantry would have been ridden down and disorganised. Cavalry should operate on the flanks or at least significant gaps like the one we left in our fighting line should be made for them to operate in. 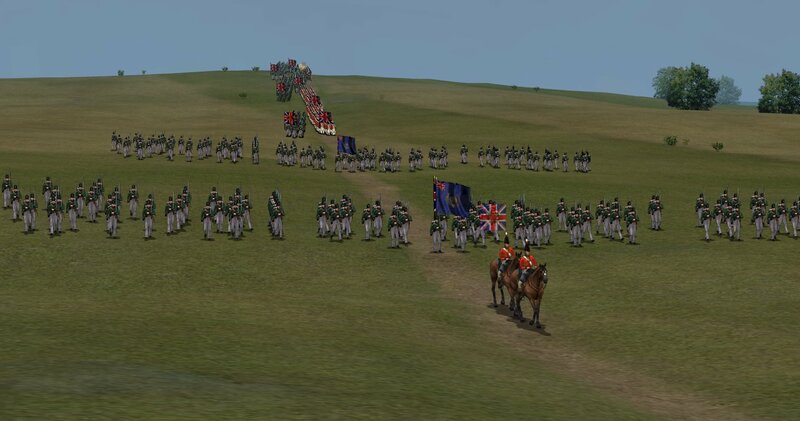 Alternatively a cavalry and an infantry commander should co-operate and the infantry form divsion columns or squares to let the cavalry pass through. That would work. 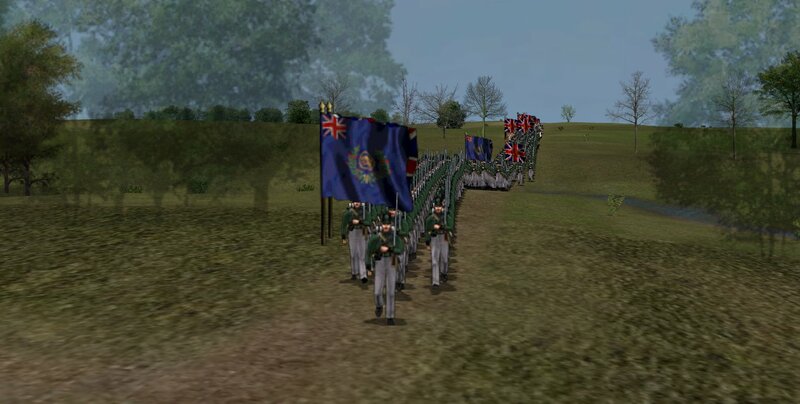 In reality these grenadiers and carabiniers brigades were the pityful cavalry I commanded in game till now; I don't know what was with the AI of units but also with the aggressive stance and high morale every time they entered in the autocharge range from a enemy unit the AI set alone the retreat button before enter in combat. The same with the commanders with aggressive stance they fall the brigade back alone very frequently. It was like the worked at the opposite. At the very end of game I had to disable all the regiments AI for charge a little. So all my movements at the end are only my attempts to force the troops to remain in line , at the end it was the Palmer infantry alone which repelled the assaults. Indeed, given the shocking disobedience of the cavalry squadrons for the bulk of the match if anything was overpowered it was Mitra himself rather than his (admittedly high quality) command. Bear in mind that for the bulk of the match it was Palmer's bde and Mitra with his light brigade facing off against Digby's division - and then Digby's division and Uxbridge's command. So far as my orders were concerned they weren't even trying to clear the objective, just hold you gentlemen off our flank while we concentrated our grand battery, three brigades of foot and the heavy cavalry brigade to receive your right's assault and then destroy them, allowing us to concentrate against your left and clear the objective before the end of the match. Classic Napoleonic tactics really, and I was pleased to have a skilled command team that made them practicable. Looking at the field at the start I determined that provided we could keep any Allied formations on the objective engaged, Wellington could not pursue the remainder of the Armee du Nord without dealing with us first; as such, we didn't need to hold the objective all day, provided we contested it and controlled it at the end. When we confirmed that Digby was descending on our flank with a possible division, I instructed Ron to rotate his junior brigade into the main line from reserve, turning his senior brigade right with cavalry support to destroy you if you were only a KGL brigade, and hold you off if you were any more. He did excellently, and while the heavy cavalry refused to do anything I was telling it to the Allied right launched a powerful assault toward the grand battery Steve had sited on the crest of the hill - our own brigades stealing a leaf from the Iron Duke's playbook and sheltering twenty paces back on the reverse slope. Fortunately all brigade commanders along the ridge had been readied for any rapid Allied advance on the guns, and even before my couriers reached them they were already completing the planned maneuver; advancing to shelter the guns and repel the attack. Once they began to fall back I instructed Mitra to draw the heavy cavalry up to his command area and BeefStu to proceed to the right to support Palmer, while Steve counter-charged gloriously across the field, silencing the Allied grand battery and rolling up that wing. About 11:15 I could see French infantry in the allied position there, and our right seemed fairly stable - increasingly bloody with flurries of cavalry going back and forth (Mitra's horse seemed unwilling to charge home at that point, while Hays' was all too happy to and kept breaking units just too far away from their officers to square in time), but able to hold against the increasingly weary men of Picton's division. At this stage I instructed Steve to disengage and come across to the right to drive Digby's division off the objective, giving him 15 minutes or so to complete the maneuver and ensure his batteries were providing fire support into the area; then half an hour to complete the engagement and polish off Wellington's pursuit. Five or ten minutes later I could see the columns of divisions rolling over the slope towards us, and the Allies fell back in full retreat. The Caribiniers aren't light cavalry, they were almost rated as Guard troops and could be called Guard Cuirassiers. Heavy elite cavalry without a doubt. And yes, the ability to split the cavalry command in two gave the French the ability to have small active player-controlled cavalry brigades in two places which was fatal to the Allies. That the cavalry wouldn't charge wasn't the issue I don't think. They were there and kept rumbling straight through their own infantry lines to come at us again and again forcing us into square. The fact the charges didn't make contact isn't really the point and in fact it could be seen as an actual benefit! I too have noticed that crappy low experience cavalry seems to charge more easily. I wonder if the numbers are reversed. Mr. Digby wrote: The Caribiniers aren't light cavalry, they were almost rated as Guard troops and could be called Guard Cuirassiers. Heavy elite cavalry without a doubt. And yes, the ability to split the cavalry command in two gave the French the ability to have small active player-controlled cavalry brigades in two places which was fatal to the Allies. That the cavalry wouldn't charge wasn't the issue I don't think. They were there and kept rumbling straight through their own infantry lines to come at us again and again forcing us into square. The fact the charges didn't make contact isn't really the point and in fact it could be seen as an actual benefit! In theory yes - indeed, that was certainly the intent (I seem to recall planning to send the heavy elite brigade charging straight through the thinned Allied line to take out the guns), but as it was they just trotted down the slope and sat within easy range of the allied infantry. And refused to move away. I've not experienced this but then again I never use AI cavalry. I TC every squadron and direct it personally. I find it the only way to get cavalry to be useful. Ah well, that leads me to where I was sending couriers and trying to take command of the individual squadrons - to no avail. I had to let Steve set up the guns where I indicated as well, since their commander obstinately continued off away from me. Watching your video Mitra was pretty sobering. Most of the time you sat well back and couldn't even see much of the action, yet you directed five cavalry squadrons from back there, well enough to keep me pinned down on the Allied far left.